Fabien Alain Barthez (French pronunciation: ​[fabjɛ̃ baʁtɛz]; born 28 June 1971) is a French former footballer and racing driver who played as a goalkeeper. At club level, he played football in both France and England with Toulouse, Marseille, AS Monaco, Manchester United, and Nantes. At international level, he represented the France national team, with whom he won the 1998 FIFA World Cup, UEFA Euro 2000, and the 2003 FIFA Confederations Cup, representing his nation at a total of three editions of both the FIFA World Cup and the UEFA European Championship; he also reached the final of the 2006 FIFA World Cup, after which he retired from international football. Nicknamed Le Divin Chauve ("The Divine Bald One"), due to his trademark shaved head, Barthez is France's most capped player in the FIFA World Cup, with 17 appearances at the finals and shares the record for the most World Cup finals clean sheets with Peter Shilton, with ten. In club football, he won the UEFA Champions League with Olympique Marseille in 1993 as well as several Ligue 1 and Premier League titles. After retiring from football in 2007, Barthez began a career in motorsport in 2008. Born in Lavelanet, France, Barthez made his first division debut for Toulouse on 21 September 1991, against Nancy. He joined Marseille in 1992, and won both the French championship and the Champions League at the end of his first season in Marseille, keeping a clean sheet in a 1–0 victory over A.C. Milan in final of the latter competition. The 1993 victory made him the youngest goalkeeper to win a Champions League title until Iker Casillas did so in 2000. Marseille, however, would be stripped of their domestic title, though not of the Champions League crown, due to their involvement in a domestic match fixing scandal, and a year later (1994) would suffer a forced relegation to the second division due to a related financial bankruptcy. He stayed with the club in Division 2 for the 1994–95 season despite many offers from elite French clubs, helping Marseille to the title and to earn promotion to the first division. In 1995, Barthez joined AS Monaco and won Ligue 1 titles in 1997 and 2000. He also played in Jean Tigana's talented Monaco side which famously put his future club Manchester United out of the Champions League in 1998 on away goals after a 1–1 draw at Old Trafford. As a result of Barthez's success in the World Cup and the Euros, he caught the attention of Manchester United manager Sir Alex Ferguson, who was searching for a star goalkeeper to replace the recently departed Peter Schmeichel, as Ferguson did not think that the previous season's goalkeeper, Mark Bosnich, was a long-term replacement. Barthez joined United for £7.8 million in 2000. He was later reunited with national teammate Laurent Blanc, who joined United in 2001. The Barthez–Blanc head-kissing ritual was performed at the start of Champions League matches. Well known for being eccentric, Barthez started out well for Manchester United. His first season was a triumph as he answered all the questions about how he would handle rainy Manchester compared to sunny Monaco. Barthez performed brilliantly throughout the season and became a crowd favourite. The fans loved his eccentric behaviour, his taunting dribbles and step-overs past opposing strikers, and most importantly, his remarkable reaction saves. Very often it was critical saves that kept United from defeat or dropping valuable points, helping United to the 2000–01 FA Premier League title, their third in a row. A memorable incident happened when Manchester United faced Leeds United in March 2001. After dropping a cross from Robbie Keane, Barthez deliberately kicked out with his foot at Ian Harte, who fell to the ground on the edge of six yard box, and the referee awarded a penalty to Leeds. Harte stepped up but Barthez made a low, one-handed save to his right. The only blemish in his first season was his failed attempt at "psyching out" West Ham United's Paolo Di Canio in the FA Cup Fourth Round; Di Canio beat the offside trap, while Barthez stood still with his hand up expecting the referee to blow his whistle, or Di Canio to stop. Di Canio continued and scored the only goal of the game, and later said it was "better to score and then see whether the goalkeeper is right or wrong". The 2001–02 season was split into two parts for him. The first half was a nightmare. The Frenchman seemed to be taking some unnecessary risks outside his penalty area, and his antics began to have consequences that allowed unneeded goals for opposing teams. He was at fault for two goals in a 3–2 home defeat by Deportivo de La Coruña in October 2001. Ferguson said how "eventually he will get caught out" and it wouldn't happen again. But another couple of late errors against Arsenal in a 3–1 defeat at Highbury the following month put much pressure on Barthez, with two goals gifted to Thierry Henry, one of which came from a mis-hit clearance. Barthez was at the centre of further controversy when, after already being on a yellow card following an argument with Matthew Upson, he was caught by television cameras raising his middle fingers behind his back towards he Arsenal supporters, who had been taunting him for his errors towards the end of the match; the incident was missed by the referee Peter Jones, however. There was much speculation as to what was the source of Barthez's decline, and critics such as the BBC's Phil McNulty urged him to be dropped. Sir Alex Ferguson, however, had faith in his goalkeeper and stuck by him. Consequently, in the second half of the season, Barthez repaired his reputation with consistent, solid performances and the spectacular saves that he was famous for. His turn in fortunes was shown in a 2–2 draw with Derby County at Pride Park. Derby forward Malcolm Christie looked to have sealed his hat-trick, but referee Steve Dunn controversially disallowed the goal, ruling that Christie kicked the ball out of Barthez's hands. He was also noted for playing mind games before opposition players took a penalty. The first time this occurred was in November 2001 when Leicester City came to Old Trafford. As Muzzy Izzet prepared to take a penalty, Barthez stood aside from the goal, with his hands behind him on the post. Izzet, tired of waiting, slotted the ball in the bottom corner, but referee Andy D'Urso made him retake the penalty, this time with Barthez in goal. Izzet went the same way, but Barthez denied him with a fine save to his right. An almost identical incident happened less than a year later in October 2002, when Barthez was unhappy about the awarding of a penalty to Fulham, and so went from post to post banging his boots, and refused to be in goal for the penalty. This time he was booked for his antics by referee Mike Dean, and so he then took his place between the posts and made it work again by saving Steed Malbranque's spot kick. The 2002–03 season ended with another Premier League crown for United. The season was a mixed bag for Barthez. One highlight was a fabulous save to deny Dietmar Hamann's 30-yard rocket at Anfield against Liverpool, as United held on to win 2–1. In other games, he let goals go past him that shouldn't have, and suffered from a run of poor form towards the end of the season. Barthez was also widely criticized in United's exit to Real Madrid in the Champions League, especially for Ronaldo's opener which beat him at the near post. It would prove to be his last ever game with United as Sir Alex Ferguson's patience had finally run out. Barthez was dropped for the final three games of the season, with Roy Carroll taking his place. Barthez's poor form at the end of the previous season and the arrival of American newcomer Tim Howard in summer of 2003, saw the Frenchman face competition for a starting spot at United. As Barthez had only returned from international duty in August, Howard played during the club's American tour of the summer, and his performances led Ferguson to choose him to start over Barthez in the Community Shield in August. By October, Howard had won the starting goalkeeper's job from Barthez; as a result, United agreed to release Barthez from his contract at Old Trafford after the 2003–04 season, and also agreed to loan Barthez out to his former club Marseille for the remainder of that season. FIFA, however, blocked the loan deal on the grounds that it was not agreed upon within the international transfer window. The two clubs agreed on a loan deal after the transfer window reopened on 1 January 2004, and Barthez joined Marseille soon afterwards. 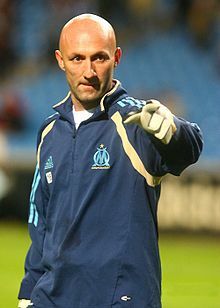 On 27 April, Marseille and Barthez agreed to a two-and-a-half-year contract which would keep him at the club until spring 2006. Barthez was involved in a controversy during a friendly match between Marseille and Morocco's Wydad Casablanca on 12 February 2005. With ten minutes left, a Marseille player was sent off and a brawl erupted between players on the pitch. Barthez was reported for spitting on the Moroccan referee. On 21 April, Barthez was summoned to a hearing before the disciplinary committee of the French Football Federation (FFF); the following day, he received a six-month suspension, with the last three months being suspended. In an unusual move, the federal council of the FFF appealed the suspension, arguing that the punishment should have been for a minimum of six full months. Eventually, his suspension was extended to six full months due to political pressures. On 8 August 2006, Barthez announced he was still hoping to play professional football for another two years, insisting he was also looking to continue his career in the French international setup. His ideal scenario would have been a return to first club Toulouse, where he could be close enough to allow him to take care of his sick mother. But he said if he did not have a club by 31 August he would not carry on with football. On 5 October 2006, it was confirmed that he had retired from football, having failed to agree a return to Toulouse. Barthez commented, "The only club I wanted to go to was not so happy to have me. It happens and you have to live with it." Barthez playing for Nantes against St. Etienne in 2006. On 17 December 2006, Barthez announced his return to football by signing a contract with Ligue 1 side Nantes, who were lacking an experienced goalkeeper following Mickaël Landreau's move to Paris Saint-Germain the previous summer. Serbian goalkeeper Vladimir Stojković, originally recruited to replace Landreau, failed to impress and left Nantes at the winter break following a rift within the squad. On 29 April, Nantes chairman Rudi Roussillon announced that following an altercation with a Nantes fan, Barthez had left the city with his family. The next day, Barthez confirmed that he had quit the team, and the club terminated his contract. Barthez denied that he was planning to retire, and in an article for French daily L'Équipe, he said that he was looking for another contract for at least two years. Since then, Barthez has been linked with numerous clubs but nothing has ever materialised and he had to face never playing professional football again. In 2012, Barthez became the honorary president of Championnat National team Luzenac, where he personally picked Quentin Westberg and Nicolas Dieuze to sign for the club. On 26 May 1994, Barthez won his first cap for France in a 1–0 victory against Australia. Barthez was understudy to Bernard Lama at UEFA Euro 1996 – at which France reached the semi-finals – after testing positive for cannabis earlier that year; he was suspended for two months as a result. Following a later suspension to Lama instead, however, Barthez subsequently gained the number one goalkeeping position shortly after the tournament and would not relinquish it for a decade. In the 1998 FIFA World Cup, which was hosted by his home country, Barthez conceded only two goals in seven games and won the Yashin Award as the best goalkeeper of the tournament, also placing second in the IFFHS World's Best Goalkeeper award that year, behind José Luis Chilavert. Barthez was also well known during the tournament for letting teammate and good friend Laurent Blanc kiss his shaved head before the start of every match, supposedly for good luck. Barthez was an integral part of his national team's inaugural triumph which also made it the first time in 20 years that a host had won the World Cup. He kept five clean sheets throughout the tournament, with the only goals he conceded being a penalty in the group stage against Denmark, and another goal against Croatia in the semi-final. In the quarter-final shootout defeat of rivals Italy, he kept a clean sheet, and also saved Demetrio Albertini's penalty kick. He kept another clean sheet in the final, which ended in a 3–0 win over defending champions Brazil. During the game, Barthez was also at the centre of a notable controversial incident when he made a spectacular save while rushing out and attempting to anticipate Brazilian superstar Ronaldo, doing his trademark leap/step-over the attacking striker to grab the ball, which injured Ronaldo in the process; Barthez later commented that he never intended to hurt the striker. Following France's World Cup victory, Barthez was one of the most popular national players in France, after Zinedine Zidane. Two years later, Barthez was again the starter as his country won Euro 2000. It was the first time in over 20 years that a national team held both the World Cup and Euro titles, a feat last accomplished by West Germany in 1974. After that triumph, France held the top position in the FIFA World Rankings system from 2001 to 2002. Barthez played on France's World Cup team again in 2002 in which they exited in the first round without winning a game or scoring a goal; he kept his only clean sheet of the tournament in his nation's second group match, a 0–0 draw against Uruguay. He was also his nation's starting keeper throughout their victorious Confederations Cup campaign in 2003, and at Euro 2004; in the latter tournament, he saved David Beckham's penalty shot in the opening round robin match, but France went out in the quarter-finals to eventual winners Greece. His place as starting goalkeeper in France's 2006 World Cup campaign, in the face of a substantial public campaign in support of Grégory Coupet, was surprising to many, even more so given Coupet's flawless performance in the remainder of the World Cup qualifying campaign after Barthez's suspension. The decision was met with derision in the French press and also led to Coupet's walking out of the national squad before the tournament, though he was to return one day later. The move was viewed by some as a desire to keep the veterans of France's 1998 World Cup victory on the team. L'Equipe reported after the World Cup that Barthez would have walked out of the squad had he not been named the starter. France had a slow start in the group stage, drawing their first two games and putting their playoff chances at risk. Fortunately, Barthez's team found their form and won their final round robin match 2–0 to advance to the next stage, where they upset heavily favoured Spain 3–1 in the round of 16. In defeating Brazil, 1–0 on 1 July 2006, Barthez, having made only one save in the game (on an injury time shot from Ronaldo), became the first keeper to blank the Brazilian team in consecutive World Cup finals matches, the first being the 1998 final (3–0). France is now one of only four nations (along with Italy, Argentina and the Netherlands) to have shut Brazil out twice in the World Cup finals, and the first to have done it in consecutive matches, both times with Barthez in goal. Barthez again kept another clean sheet – his fourth of the tournament – in the semi-final against Portugal (with Zinedine Zidane's penalty shot the winning goal), though he appeared in questionable form. A few minutes from time, he spectacularly spilled a free-kick which Luís Figo recovered, heading over the bar although unchallenged. He did, however, redeem himself in injury time when a French defender fumbled the ball, enabling a Portuguese player to mount a last-moment attack. Barthez scrambled out of the net and blocked the first shot. During the final against Italy, he briefly captained his team for the remainder of the second period of extra time after Zidane was sent off. During the penalty shootout, neither he nor his Italian counterpart Gianluigi Buffon made a save, and France striker David Trezeguet's missed shot ultimately proved decisive. This proved to be Barthez's 87th and final international appearance, as he retired from international football following the tournament. After retiring from football in 2007, Barthez began a career in motorsport in 2008. He began competing at selected events in the Porsche Carrera Cup France that year with the team SOFREV Auto Sport Promotion. He also competed at two events in the THP Spider Cup. In 2009, he raced in a number of various motorsport series such as the French GT Championship, Bioracing Series and the Caterham Sigma Cup France as well as the Porsche Carrera Cup France. He continued to race in the FFSA GT Championship in 2010 and picked up his first podium in race 1 at Dijon-Prenois. In the 2012 season, he won his first race in the FFSA series at the Circuito de Navarra in race two and finished seventh in the championship. In 2013, he was crowned French GT Champion alongside Morgan Moullin-Traffort, driving a Ferrari. In 2013, he also competed in the newly re-branded FIA GT Series alongside Gérard Tonelli in the Gentleman Trophy class with SOFREV ASP driving a GT3-spec Ferrari 458 Italia. In February 2014, it was announced that Barthez would be entered into the 2014 24 Hours of Le Mans, driving Sofrev ASP's Ferrari 458. Barthez and his co-drivers finished 29th overall and ninth in LMGTE Am class. On 2 July 2010, following Laurent Blanc's appointment as the new manager of the French national team, Barthez was named among the team's technical staff as a goalkeeping coach. Rated by pundits as one of the greatest goalkeepers of his generation, in his prime, Barthez was considered to be one of the best goalkeepers in the world, and is regarded as one of the best French players ever in his position, being named the fourth greatest French goalkeeper of all time in IFFHS' Century elections, behind Bernard Lama, Pierre Chayriguès, and Julien Darui. Standing at 1.80 m (5 ft 11 in), he was not particularly tall for a goalkeeper, although he was extremely athletic, and was known for his elevation, as well as his decision-making, bravery, ability to read the game, and commitment when coming out to collect the ball, which made him effective in the air and enabled him to command his area effectively in spite of his short stature; however, at times he was still caught out on high balls due to his lack of height, and he also came under criticism on occasion for his indecisiveness when struggling to deal with crosses. A flamboyant and instinctive keeper, he was also extremely agile, and possessed excellent reflexes, which enabled him to produce spectacular, acrobatic, and decisive reaction saves; he also possessed a good positional sense. In addition to his shot-stopping abilities, Barthez was also known to be a passionate, popular, and highly recognisable footballing figure, who stood out for his outgoing personality, self-assurance, and composure under pressure, as well as his leadership from the back and authoritative presence in goal. Furthermore, Barthez was highly regarded for his exceptional skills with the ball at his feet, as well as his accurate distribution with his left foot, which enabled him to play the ball out from the back or launch an attack with his quick throws or long goal kicks; his confidence in possession often led him to be involved in the build-up of plays, and he often operated outside the penalty area, and would even occasionally attempt to dribble with the ball past opposing strikers with feints such as nutmegs or stepovers. He was also very quick off his line, and often acted as a sweeper-keeper, thus contributing to the evolution of the role. While he received plaudits for his goalkeeping ability in the media, throughout his career Barthez also frequently came under criticism from pundits for his stubbornness, and his aggressive, unorthodox, and eccentric style of play, as well as for taking unnecessary risks, and was also deemed to be inconsistent, unreliable, and prone to errors and lapses in concentration. Through his career, Barthez was known for his active romantic life, and dated Canadian model Linda Evangelista. She became pregnant but miscarried, six months into the pregnancy. The couple broke up in the year 2000, reunited in 2001, and then officially ended their relationship in 2002. Barthez later married French R&B singer Ophélie Winter; together, they have a son, Daniel, born in 2003. Barthez is a smoker. Known for his eccentric and superstitious personality, Barthez often wore red briefs underneath his goalkeeping shorts, and usually cut off the sleeves of his goalkeeping jersey. Although most starting goalkeepers are usually assigned the number 1 shirt, he instead chose to wear the number 16 shirt. During his playing career, Barthez signed advertising deals with McDonald's and Adidas. ^ "Fabien Barthez". Barry Hugman's Footballers. Retrieved 3 September 2018. ^ Hugman, Barry J., ed. (2003). The PFA Footballers' Who's Who 2003/2004. Queen Anne Press. p. 38. ISBN 978-1-85291-651-0. ^ a b c d e f g h i j k l m n o "Behind the World Cup record: Fabien Barthez". FIFA.com. 10 July 2017. Retrieved 16 January 2018. ^ a b c d e f g h i j k Fabien Barthez (12 July 2014). "Barthez, il grado zero della parata" (in Italian). La Repubblica. Retrieved 16 January 2018. ^ a b c d e f g h Jon Brodkin (3 July 2000). "Barthez cries out for a new life in Manchester". The Guardian. Retrieved 16 January 2018. ^ "Marseille 1-0 Milan". UEFA.com. Retrieved 16 January 2018. ^ Dupuis, Maxime (6 October 2006). "Barthez en dix dates". Eurosport.fr. Eurosport. Retrieved 28 April 2011. ^ "Monaco and bust for sorry United". The Independent. 19 March 1998. Retrieved 30 December 2014. ^ "Man Utd confirm Barthez signing". BBC Sport. BBC. 31 May 2000. Retrieved 3 January 2014. ^ "Man Utd seal Blanc deal". BBC Sport. BBC. 30 August 2001. Retrieved 3 January 2014. ^ a b c d e f g h i Lawton, James (27 November 2001). "Fabien Barthez: The goalkeeper's fear of losing it". The Independent. London: Independent Print. Retrieved 2 April 2010. ^ a b "Fergie's men survive Ipswich scare". BBC Sport. 22 August 2000. Retrieved 16 January 2018. ^ a b c d e f "Saving grace: Europe's favourite goalkeepers". UEFA.com. 30 January 2015. Retrieved 16 January 2018. ^ "Man Utd win their third consecutive Premier League title and their seventh overall". www.premierleague.com. 31 May 2001. Retrieved 16 January 2018. ^ "United history: 2000 to 2009". www.manutd.com. Archived from the original on 21 January 2015. Retrieved 16 January 2018. ^ "Barthez survives to save United". The Telegraph. Telegraph Media Group. 3 May 2001. Retrieved 3 January 2014. ^ "Di Canio: Barthez did not fool me". BBC Sport. BBC. 29 January 2001. Retrieved 3 January 2014. ^ "Di Canio sinks Man Utd". BBC Sport. BBC. 28 January 2001. Retrieved 3 January 2014. ^ Lacey, David (29 January 2001). "Di Canio takes his chance". The Guardian. Guardian News and Media. Retrieved 3 January 2014. ^ "Di Canio - Barthez didn't confuse my brain". The Guardian. Guardian News and Media. 29 January 2001. Retrieved 3 January 2014. ^ "Champions League: United exposed by Barthez blunders". The Telegraph. Telegraph Media Group. 17 October 2001. Retrieved 3 January 2014. ^ "Champions League: Ferguson gets tough on Barthez". The Telegraph. Telegraph Media Group. 18 October 2001. Retrieved 3 January 2014. ^ "Barthez errors gift Arsenal win". BBC Sport. BBC. 25 November 2001. Retrieved 3 January 2014. ^ Gordon Tynan (27 November 2001). "Arsenal defeat 'a disaster', says Ferguson". The Independent. Retrieved 16 January 2018. ^ "Fabien's follies". BBC Sport. BBC. 26 November 2001. Retrieved 3 January 2014. ^ "Derby thwart Man Utd". BBC Sport. BBC. 3 March 2002. Retrieved 3 January 2014. ^ "Ferguson strikes back". BBC Sport. BBC. 18 November 2001. Retrieved 3 January 2014. ^ "Barthez stunt foxes Izzet". The Telegraph. Telegraph Media Group. 17 November 2001. Retrieved 3 January 2014. ^ "United survive by playing the joker". The Guardian. Guardian News and Media. 21 October 2002. Retrieved 3 January 2014. ^ a b Howard Nurse (4 May 2003). "Ferguson's best yet". BBC Sport. Retrieved 16 January 2018. ^ Henry Winter (2 December 2002). "Horror show for Dudek". The Telegraph. Retrieved 16 January 2018. ^ "Ferguson defends decision". BBC Sport. BBC. 24 April 2003. Retrieved 2 April 2010. ^ "Carroll wants number one spot". BBC Sport. 1 May 2003. Retrieved 16 January 2018. ^ Sam Wallace (29 April 2003). "Barthez doubts deepen as Ferguson lines up Cechanf". The Telegraph. Retrieved 16 January 2018. ^ "Howard joins Man Utd". BBC Sport. 15 July 2003. Retrieved 16 January 2018. ^ Dominic Fifield (16 July 2003). "American dream becomes reality for Howard". The Guardian. Retrieved 16 January 2018. ^ "Howard edges out Barthez". The Telegraph. 10 August 2003. Retrieved 16 January 2018. ^ "France duty cost Barthez United place: Fergie". ABC News. 17 October 2003. Retrieved 16 January 2018. ^ Peter O'Rourke. "Ferguson explains Barthez move". Sky Sports. Retrieved 16 January 2018. ^ "Barthez in Marseille talks". BBC Sport. 17 October 2003. Retrieved 16 January 2018. ^ "Marseille warned over Barthez move". CNN. 17 October 2003. Retrieved 16 January 2018. ^ Charlie Norton (31 October 2003). "Barthez hold-up as FIFA block move to Marseilles". The Telegraph. Retrieved 16 January 2018. ^ "Keeper Barthez finalizes loan deal". CNN. 2 January 2004. Retrieved 16 January 2018. ^ "Marseille sign Barthez". BBC Sport. 28 April 2004. Retrieved 16 January 2018. ^ Da Costa, Philippe (6 October 2006). "Barthez, l'atypique". Eurosport.fr. Eurosport. Retrieved 28 April 2011. ^ "Barthez banned for spitting at ref". UEFA.com. 22 April 2005. Retrieved 16 January 2018. ^ "Barthez announces his retirement". BBC Sport. BBC. 5 October 2006. Retrieved 2 April 2010. ^ a b c d "Goalkeeper Barthez quits football". CNN. 5 October 2006. Retrieved 16 January 2018. ^ "Struggling Nantes lure Barthez from retirement". ESPN FC. ESPN Internet Ventures. 16 December 2006. Retrieved 3 January 2014. ^ "Barthez quits Nantes after attack". BBC Sport. BBC. 30 April 2007. Retrieved 3 January 2014. ^ "Fabien Barthez inspires tiny Luzenac to dream big". ESPN. BBC. 15 January 2014. Retrieved 30 January 2014. ^ a b c d e f "Fabien Barthez". BBC Sport. Retrieved 16 January 2018. ^ "FABIEN BARTHEZ BANNED AFTER FAILING DRUG TEST". The Independent. 17 January 1996. Retrieved 16 January 2018. ^ "1998 FIFA World Cup France". FIFA.com. FIFA. Archived from the original on 14 February 2012. Retrieved 28 April 2011. ^ José Luis Pierrend (25 January 2000). "IFFHS' World's Best Goalkeeper of the Year 1998". RSSSF. Retrieved 16 January 2018. ^ Dario Di Gennaro (3 July 1998). "Italia-Francia, 1998 0–0 (3–4)". rai.it (in Italian). Rai Sport. Retrieved 13 June 2012. ^ "France-Brazil 3-0". 12 July 1998. Archived from the original on 21 July 2011. ^ "Gol d'oro per Trezeguet e la Francia" [Golden goal for Trezeguet and France] (in Italian). UEFA.com. Retrieved 29 January 2015. ^ "Classement mondial FIFA/Coca-Cola (mai 2001)" (in French). FIFA.com. 16 May 2001. ^ Valérie Gas (11 June 2002). "La France éliminée" (in French). ^ "Sans Zidane mais avec des surprises" (in French). Eurosport. 2 June 2003. Retrieved 16 January 2018. ^ "Tragedia greca, Francia fuori" (in Italian). UEFA.com. 25 June 2004. Archived from the original on 5 January 2013. Retrieved 7 July 2012. ^ a b c d e Jon Brodkin (8 July 2006). "Barthez ready to grasp another chance to show France are still safe in the old guard's hands". The Guardian. Retrieved 16 January 2018. ^ "Italy 1 – 1 France (5–3 pens)". The Guardian. Retrieved 27 June 2014. ^ "Former United star Barthez wins French GT Series". ESPN (UK). 29 October 2013. Retrieved 3 June 2014. ^ Tremayne, Sam (3 June 2014). "Sebastien Loeb gets slot as 2014 Le Mans 24 Hours entry revealed". autosport.com. Retrieved 3 June 2014. ^ "La fiche de Fabien BARTHEZ" (in French). L'Équipe. Retrieved 27 October 2015. ^ a b c d "Barthez plays the field". BBC Sport. 25 July 2001. Retrieved 16 January 2018. ^ a b c d e f g "Worst players to win the Champions League". ESPN FC. 24 May 2013. Retrieved 16 January 2018. ^ a b c d e Paul Wilson (28 January 2001). "Barthez, the best buy". The Guardian. Retrieved 16 January 2018. ^ a b c d e f g h i David Barnes (25 February 2001). "Smoking Barthez ignores Ferguson". The Guardian. Retrieved 16 January 2018. ^ a b c d e "Fabien Barthez". BBC. Retrieved 16 January 2018. ^ a b c "Fabien Barthez" (in French). www.larousse.fr. Retrieved 16 January 2018. ^ Karel Stokkermans (30 January 2000). "IFFHS' Century Elections: Countrywise Elections: France - Keeper of the Century". RSSSF. Retrieved 16 January 2018. ^ a b Matt Lawton (5 December 2000). "Barthez holds whip hand as United face devil of a job". The Telegraph. Retrieved 16 January 2018. ^ "FIFA Technical Study Group designates MasterCard All-Star Team". FIFA.com. 10 July 1998. Retrieved 13 August 2018. ^ a b c "Fabien Barthez retires from soccer". CBC Sports. 5 October 2006. Retrieved 16 January 2018. ^ a b c d e "Fabien Barthez". BBC Sport. 8 April 2002. Retrieved 16 January 2018. ^ Samuel Luckhurst (30 March 2015). "Manchester United: David de Gea has made goalkeeping cool". Manchester Eevening News. Retrieved 16 January 2018. ^ a b David Barnes (4 November 2001). "Barthez's pledge to Fergie". The Guardian. Retrieved 16 January 2018. ^ "Barthez: Goalkeeping hasn't evolved enough". FIFA.com. 18 May 2015. Retrieved 16 January 2018. ^ "What is wrong with Barthez?". BBC Sport. 26 November 2001. Retrieved 16 January 2018. ^ Daniel Taylor (27 November 2001). "Its the slip-ups that stick". The Guardian. Retrieved 16 January 2018. ^ a b Craven, Jo (11 May 2011). "Linda Evangelista biography". Vogue UK. Retrieved 26 November 2014. ^ "Linda Evangelista". New York Magazine. Retrieved 13 June 2014. ^ "Linda's Delight As She Confirms Baby News". Hello Magazine. Archived from the original on 14 July 2014. Retrieved 13 June 2014. ^ a b Dow, Ian (24 August 2001). "Linda's Feeling Fab as She Plans to Wed Barthez". Daily Record (Glasgow, Scotland). Retrieved 26 November 2014. ^ Moss, Adam; Hart, Christine (12 November 2000). "Fab In Bar Bust-up; Exclusive: Man United Goalie Is Net Winner after Rumpus over Married Date". The People (London, England). Retrieved 26 November 2014. ^ Emilio Marrese (17 June 2004). "Barthez, il ritorno Altro che clown io sono un grande" (in Italian). La Repubblica. Retrieved 16 January 2018. ^ "Fabien Barthez". National Football Teams. Benjamin Strack-Zimmerman. Retrieved 28 April 2011. ^ a b c "Fabien Barthez" (in French). www.eurosport.fr. Retrieved 16 January 2018. ^ "Fabien Barthez: Overview". Premier League. Retrieved 15 April 2018. ^ "1998 FIFA World Cup France". FIFA.com. Retrieved 12 November 2017. ^ José Luis Pierrend (11 April 2001). "IFFHS' World's Best Goalkeeper of the Year 2000". RSSSF. Retrieved 12 November 2017. ^ Hugman, Barry J., ed. (2001). The 2001–2002 Official PFA Footballers Factfile. AFS. p. 368. ISBN 0-946531-34-X. ^ José Luis Pierrend (11 January 2018). "France - Record International Players". RSSSF. Retrieved 16 January 2018. Wikimedia Commons has media related to Fabien Barthez.